Distribution: poles to tropics, some dispute about how many species of Right whale there are, 2, 3 or 4. The name was given by the early whalers because they were the "right" whales to catch. They have large amounts of oil, blubber and baleen or whalebone, they are slow swimming (easy to catch) and most importantly, float when killed as opposed to the rorquals which often sank. 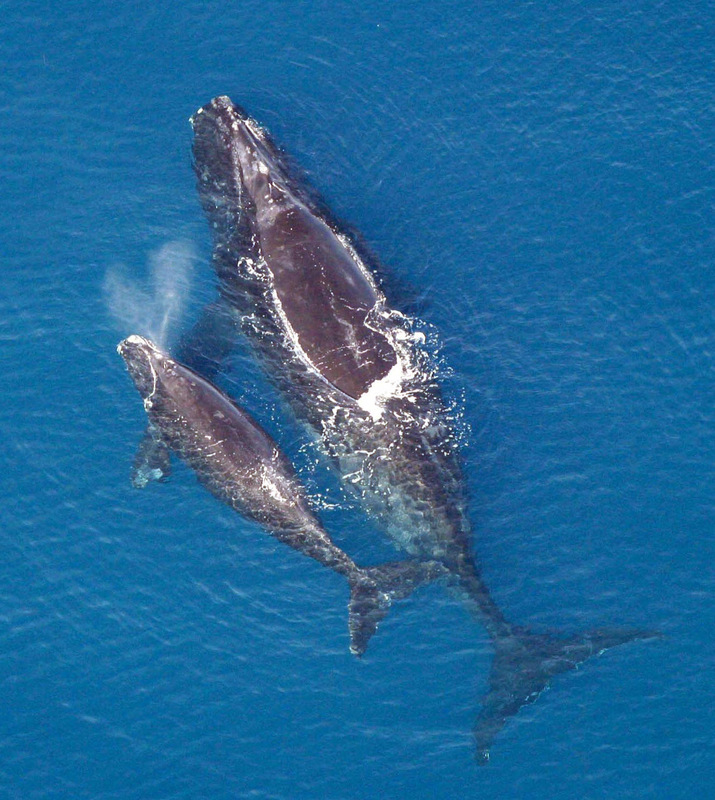 Right whales have been a protected species since 1935, though were killed illegally up to the 1970's. Currently the Right Whale population is growing from 5 - 15% per year, depending on distribution and which sub-population is being considered. The Southern Right whale seldom ventures further than about 55° South, it is found in a belt around the pole from about 20 ° South to 55° South. It is not clear whether the Southern Right Whale is a separate species to the Northern Right Whale Eubalaena glacialis or whether the two types are sub-species and comprise a single species. In any case the populations are thought to be clearly distinct and little or no mixing or exchange of individuals occurs. 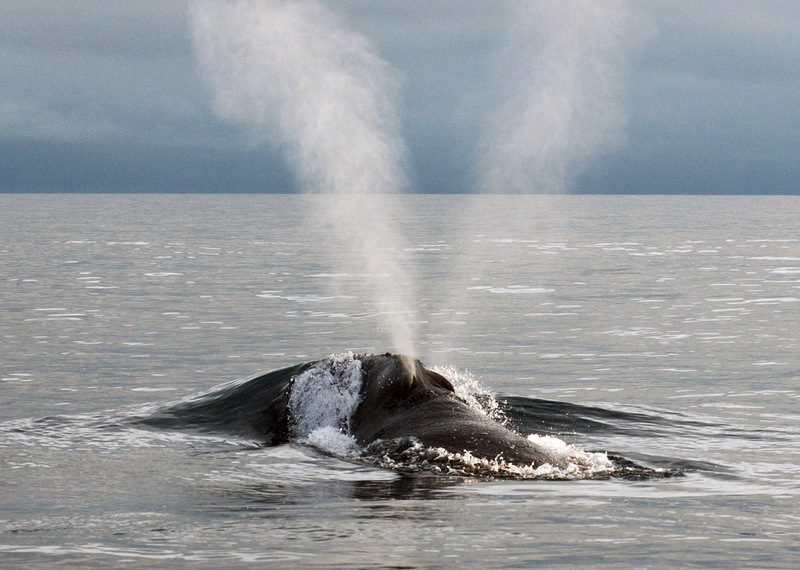 The Blow of the Right whale is short and distinctive as it is V-shaped, so the whale can often be identified at a distance from this alone. 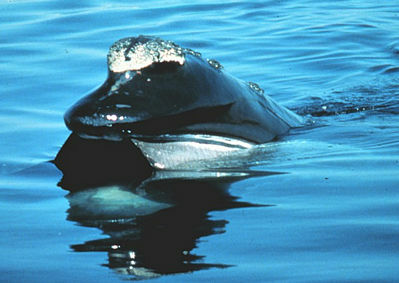 Right whales have a large bulbous head and lack the streamlined shape of other whales. The head has large callosities that are home to whole colonies of whale barnacles, parasitic worms and whale lice, not all of these are actually parasites that feed off the whale, some are just hangers on. Some of them are species only found on Right whales. They tend to be more numerous in colder high latitude waters than they are in warmer waters closer to the equator when many of the hangers on - fall off. The large callosity at the front of the head is sometimes referred to as the "bonnet" as it resembles a small dainty hat that a woman might have worn in times gone by. These callosities are so distinctive and individual to the whale that they can used to identify individuals. Left picture: Right whale (northern this time) skim feeding at the surface, the grey baleen plates can be seen at water level extending from the upper jaw. The lower jaw is under water as are the eyes which are near the hinge of the jaw. Right whales are quite distinctive as the skull can occupy from 1/4 to 1/3 of the total length, a similar proportion to the Sperm whale in fact though the two species could hardly be more different in their feeding methods and preferences. 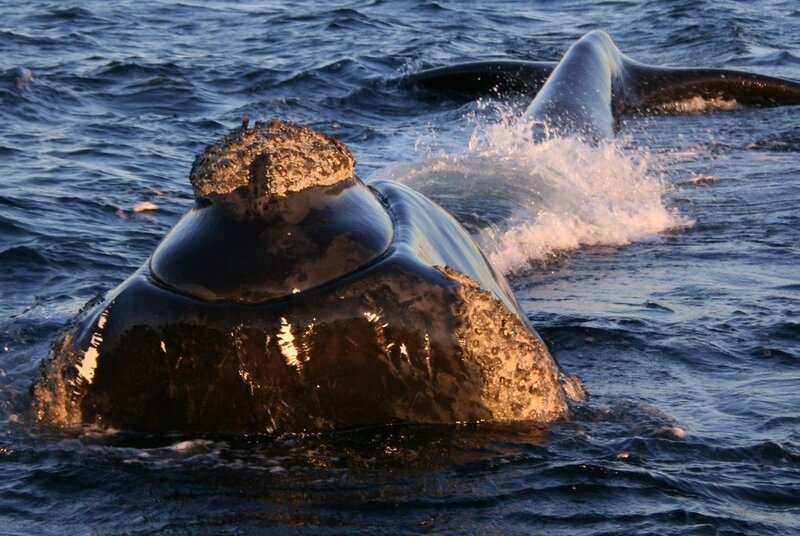 Right whales have no dorsal fin nor any pronounced dorsal ridge. The Right whale is a filter feeder. There is a huge bony rostrum that projects forwards from the top of the skull, from this hang two rows of 200 - 270 baleen plates up to 3m long in an upside down V. The bottom jaw is also elongated and there is a huge muscular tongue which is used to push water out of the mouth when a mouthful of water and food is taken in.